GrayscaleFillholeImageFilter fills holes in a grayscale image. Holes are local minima in the grayscale topography that are not connected to boundaries of the image. Gray level values adjacent to a hole are extrapolated across the hole. This filter is used to smooth over local minima without affecting the values of local maxima. If you take the difference between the output of this filter and the original image (and perhaps threshold the difference above a small value), you'll obtain a map of the local minima. This filter uses the ReconstructionByErosionImageFilter. It provides its own input as the "mask" input to the geodesic erosion. The "marker" image for the geodesic erosion is constructed such that boundary pixels match the boundary pixels of the input image and the interior pixels are set to the maximum pixel value in the input image. Geodesic morphology and the Fillhole algorithm is described in Chapter 6 of Pierre Soille's book "Morphological Image Analysis: Principles and Applications", Second Edition, Springer, 2003. Definition at line 54 of file itkGrayscaleFillholeImageFilter.h. Definition at line 63 of file itkGrayscaleFillholeImageFilter.h. 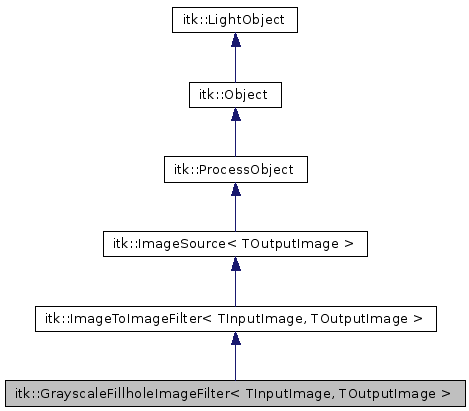 Definition at line 68 of file itkGrayscaleFillholeImageFilter.h. Definition at line 70 of file itkGrayscaleFillholeImageFilter.h. Definition at line 67 of file itkGrayscaleFillholeImageFilter.h. Definition at line 69 of file itkGrayscaleFillholeImageFilter.h. Definition at line 66 of file itkGrayscaleFillholeImageFilter.h. Definition at line 73 of file itkGrayscaleFillholeImageFilter.h. Definition at line 75 of file itkGrayscaleFillholeImageFilter.h. Definition at line 72 of file itkGrayscaleFillholeImageFilter.h. Definition at line 74 of file itkGrayscaleFillholeImageFilter.h. Definition at line 71 of file itkGrayscaleFillholeImageFilter.h. Definition at line 62 of file itkGrayscaleFillholeImageFilter.h. Definition at line 59 of file itkGrayscaleFillholeImageFilter.h. Definition at line 61 of file itkGrayscaleFillholeImageFilter.h. Definition at line 123 of file itkGrayscaleFillholeImageFilter.h. GrayscaleFillholeImageFilter will produce the entire output. Single-threaded version of GenerateData. This filter delegates to ReconstructionByErosionImageFilter. GrayscaleFillholeImageFilter needs the entire input be available. Thus, it needs to provide an implementation of GenerateInputRequestedRegion(). Get the number of iterations used to produce the current output. This method is scheduled for removal since the implementation now uses a noniterative solution. Definition at line 95 of file itkGrayscaleFillholeImageFilter.h. Set/Get whether the connected components are defined strictly by face connectivity or by face+edge+vertex connectivity. Default is FullyConnectedOff. For objects that are 1 pixel wide, use FullyConnectedOn.